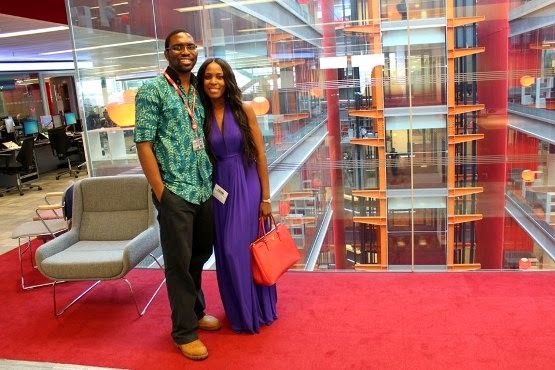 Linda Ikeji is one of the most popular female celebrity, not only in Nigeria, but in Africa. Her rise to fame and wealth through a profession that was least known and respected in Nigeria is like a puzzle to many. So difficult to comprehend that some has resorted to attributing her success to some dubious means rather than through hard work. But the truth is that she made it through blogging, 100%. To think that a couple of years ago, Linda Ikeji was just a lady with a dream and few coins In her pocket like most people around. Yet she dared to press forward. A couple even admitted that they used to laughed at her behind her back of course when they’d see her journeying to the cafe to go and blog. Now, just about 6 years down the line and those that laughed at her are nobody and Linda is a name that some of the biggest brands are proud to be associated with. She is a self made millionaire who made her money pure and clean without any form of corruption and immorality as it’s common with ladies nowadays. How do we know – you may ask? Well, you will soon find out but firstly, let’s get to know the girl, Linda Ikeji, and where she is coming from. Linda is a celebrity blogger from Nigeria who is considered to be one of the most successful internet entrepreneur (as at January 2015) in Nigeria. She was born on September 17, 1980 and started blogging in 2006 after trying her hands in so many other trades without success. According to her, blogging paid off, and today, she is living the life of her dream, the dot com life style. A graduate of English Language from University of Lagos, Nigeria, Linda is a role model to many youths in Africa who aspires to be just like her. She recently started a mentoring program “I’ll rather be self made” for Nigeria girls. Contrary to some people’s opinion, Linda’s success did not happen by chance neither was it gifted to her, it was a product of hard work and pure persistence. She started blogging at a time when internet access was least pronounced in Nigeria. She had told the story time and again of how she used to borrow money sometimes to buy airtime to blog in the cyber cafe. As a poor girl coming from a humble background, it takes high level of hard work and persistence to have continued doing what she did in such circumstances. Eventually, it paid off, and that very blog is today valued at $5million. The blog has grown over the years to become the centerpiece of entertainment and celebrity gossips in Africa. It attracts readers (mostly Nigerian females) from all over the world, making it the most active blog in Nigeria in terms of community and discussions. It is currently ranked 13 on Alexa in Nigeria and 2,259 worldwide as at the time this article is being put together. One thing that excites many watchers about the blog is the near zero overhead cost she incurs running such a massive business entity. But to some, it is her greatest undoing, considering her inability to innovate beyond Blogspot! Last year, she provided two houses to her parents. One in Lagos (a five bedroom duplex) that costs about N100 million, acquired in an estate somewhere in Surelere, Lagos. The other was built in the village (Nkwerre) and completed within six months with stone coated roof – a seven bedroom masterpiece that cost about N75 million. After she announced the purchase of her Range Rover Sport car last year, she made it public that in a matter of weeks, the deal on her own personal house would be completed. On October 2015, Linda indeed acquired a N600 million mansion in Banana Island which is one of the choicest estate in Nigeria. The first car she acquired was a Toyota Camry, 2009 model (the type that is popularly called “Big Daddy” in Nigeria) which is still a dream car to many. She fell in love with the car the first day she set her eyes on it and saved for four months to acquire one, that was in 2011. Linda stepped it up in 2013 and bought Infinity FX35 worth N8 million. In September 2014, she added another SUV, a Range Rover Sport Supercharged worth N24 million. That car caused serious riot on the internet, especially to those who did not know her true worth, those who did not know that the money used in purchasing that car was earned in less than a month. Little did those who get mad over Linda’s acquisition of N24 million Range Rover know that she actually worth N3.2billion. This is not a speculation, it’s not fallacy, Linda Ikeji is officially the first Billionaire Blogger in Nigeria. So, next time you see Linda, take a closer look at her and know that you are actually looking at a billionaire, not your average girl. If you are lucky, you could be one of the winner this month ending. All it takes is for you to be regular on her blog and be a certain number of person to comment on a particular giveaway post. The prizes ranges from N20,00 – N200,000 each to multiple winners. Her page is my favorite page on Instagram. If you really wants to get cool visual details about some private things that goes on in her life, get to her Instagram page. She sure have enough fashion to showcase on that page. Currently one of the most followed female celebrity in Nigeria on Twitter with more than 750,000 followers. I wonder why Twitter is yet to verify @LindaIkeji considering that the Twitter accounts of far less popular figures have been verified? If you’d like to get those juicy updates on gossips that that made LindaIkeji.Blogspot.com tick, get in here to follow her on Twitter @LindaIkeji. Linda is not a Facebooker, she is really not very active on Facebook and that has giving the fraudsters the opportunity to thrive, hiding under her name to create fake Facebook account they use in wrecking havoc in the lives of unsuspecting victims. When certain Pastor Chris accused Linda Ikeji of threatening to blackmail him if he did not part with some cash to her, I immediately knew that was the handiwork of Fraudsters hiding under fake Facebook accounts they created in the name of Linda. The last time Linda made post on Facebook was in May 2012 if I’m not wrong? Linda currently has no Wiki page of which I think she deserve to have one. Maybe we can take up the challenge of creating a robust wiki page for our dear Linda. The importance of having a Wikipage for a popular celebrity like her can not be over emphasized. It helps in many ways and lack of it could relegate you to the background in the eyes of many. Let’s see what to do about this in the coming months. Update: Linda Ikeji now has a wikipage on Wikipedia and we are glad to have contributed few edits. Linda was born into a Catholic family of seven children, six girls and one boy, of which she is the second child. Talk about a child who cares a lot about her family, then you are talking about Linda. Except for the elder sister who is married and living in the USA, Linda had acquired cars for all the members of the family including the youngest brother. If this is how every female child is, parents would prefer to have female children rather than male. Linda is a blessing to her family. After Linda, the next in command in the family in terms of popularity is Laura Ikeji – a lovable trouble maker. Linda is quite photogenic and I like her pictures which is one of the reasons I visit her Instagram page often. As an ex model, she knows one or two things about posing for camera, though her critic always have one or two negative things to say about her photos. But one thing I don’t think most people are comfortable about in her photos (me inclusive) is that Linda always snap her pictures on the same spot/background. That has rendered most of her shots quite monotonous and somewhat uninteresting to many. Get in here to view some of her pictures on Instagram. Expensive fashion is Linda’s thing and she spends handsomely on varieties of fashion accessories. Last time she went to Dubai for shopping, she reportedly spent about N20 million for fashion and accessories, money that can buy future for some people. She has a diamond encrusted Rolex wrist watches that cost about $25,000 (about N4.5 million) and a Fendi, plus countless other very expensive fashion accessories. It was reported that she dated CoolFM presenter, Dan Foster some years back. That was the last we ever heard of Linda and a man, maybe she is good at keeping it secret because Linda is just too beautiful to be left alone by men. Last time she was planked on live Radio, she did revealed that she has some number of men on the line that she is considering. Whether she had settled for one is not yet known but we’ll certainly update this article whenever we have the information. There is no better awards than the one you have in the bank. I’m sure you’d agree with me on this – and Linda certainly have those awards aplenty. Further to this, she has won some awards with her blog for her role in promoting new media in Nigeria. Linda is relatively free of serious scandals apart from accusations here and there from people who thinks her gossips is destroying their lives, careers, and marriages. Last year, she was accused of double standard when she failed to report the crisis in the marriage of Tiwa Savage who is known to be her friend. She has been profiled on BBC Africa – last year she was invited to London for an interview with BBC reporter, Nkem Ifejika. Her Future Plans – I know about two of her future plans, probably the ones closest to her heart. To start a TV program, maybe a talk show, and to get married and have kids. Other plans are secondary as far as I know. If you have any resources to add to this article, let us know about it through the comment and don’t forget to share this with your friends on Twitter and Facebook – use the buttons below! You didn’t miss any vital info concerning this remarkable model and blogger. Linda will continue to mentor several individuals, me inclusive. I love this post. You nailed it. Thanks for this post Constative.